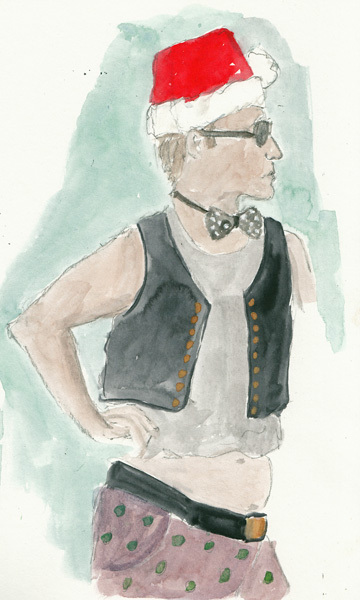 Last night was the final class of my Watercolor Class at Fashion Institute of Technology. My goal for this class was to finally spend time in a real class, instead of learning on my own, and to work bigger and looser. I have no interest in changing my main goal, which is to keep a watercolor sketchbook journal, but change and growth through a formal course can result in some changes to my pages. We learned about so many brushes, grounds, resists, and types of paint. We used Chinese White on white Illustration board and brown cardboard, and most recently gouache on black gesso, a fun technique which I still need to play with before posting my paintings. 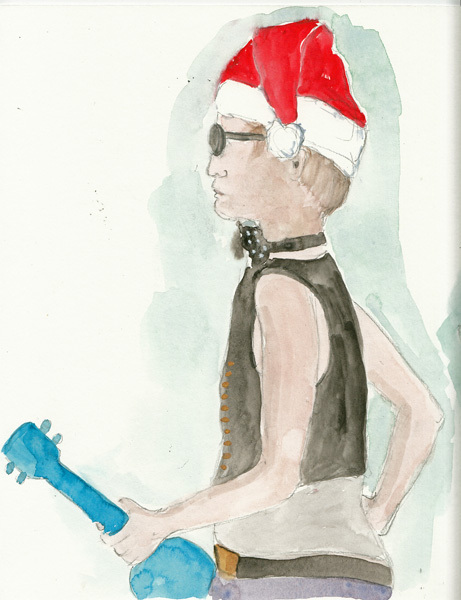 Our model last evening, the young man with the Mohawk, dressed crazy for Christmas! Here are two of my paintings and a drawing of Professor Martino as he was painting during our party. 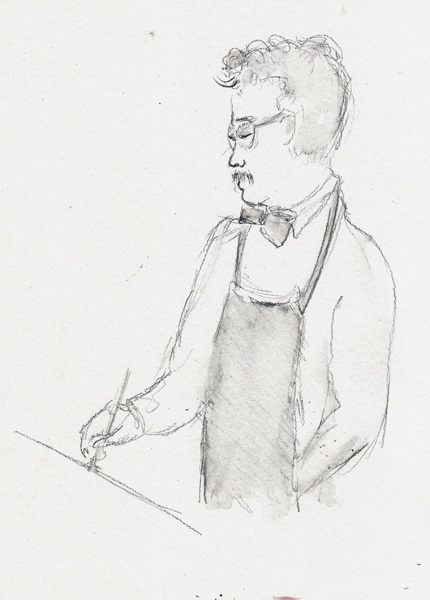 I love figure drawing sessions at the Society of Illustrators in New York City. It is a drop in program - 3 hours of drawing/painting two models who pose simultaneously. There is also live music and a bar to buy a glass of wine. From May through October I usually go to figure drawing weekly in Battery Park City - an outdoor venue that is hard to resist. But I used to go to Society of Illustrators faithfully once a month and this year my last visit was in June! On Tuesday night I went with my friend Casey who was visiting from France. I met Casey in 2007 through the Everyday Matters Yahoo Group and see her most often during NYC visits. The last time I saw her was a year ago in Paris. One of the models was new to me and I found her short poses to be challenging and fun. Here are two of her two minute poses. I sketched two 5 minute poses on the same large sheet of watercolor paper and then squeezed in another drawing. I love the challenge of trying to figure out the spacing and relationship among them. I used a sketch and wash pencil and shaded the figures with my waterbrush and clear water. These are two of the 20 minute poses. I get bored easily, and probably finished these in 15 minutes and then looked over at the sketchpads of those sitting around me. We had a great evening and 19 sketches by the end! This page was too large for scanning, thus the gray-blue background from my camera. There are lots of great gallery exhibits in New York City and my artist friends and I usually put together a list and then spend a day in a specific neighborhood. On November 18th we met at Penn Station and walked to Chelsea. My personal favorites for the day were the Max Ernst sculptures at Paul Kasmin, the Robert Rauchenberg at Pace, and the Giorgio Morandi at David Zwirner. The bunny was street graffiti! 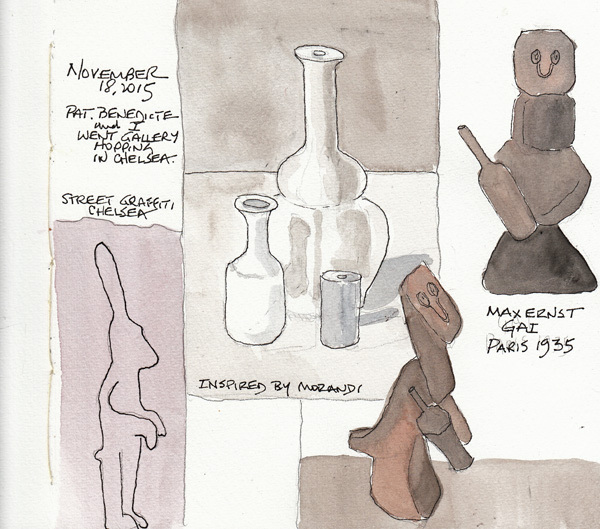 I sketched in the Galleries and painted the pages at home. There are also many terrific Museum Exhibits which opened this Fall and we've been scheduling at least 2 visits each week. 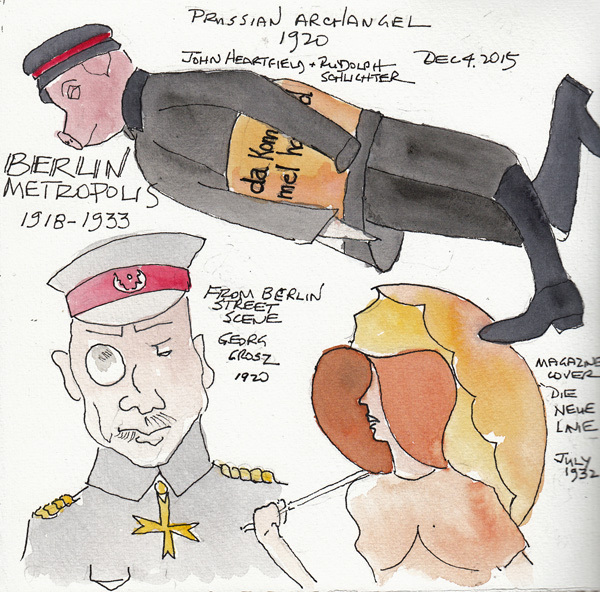 Last Friday we started at "Berlin Metropolis 1918-1933" at the Neue Gallerie and then went to the Morgan Library and Museum to see "Graphic Passion: Matisse and Book Arts." 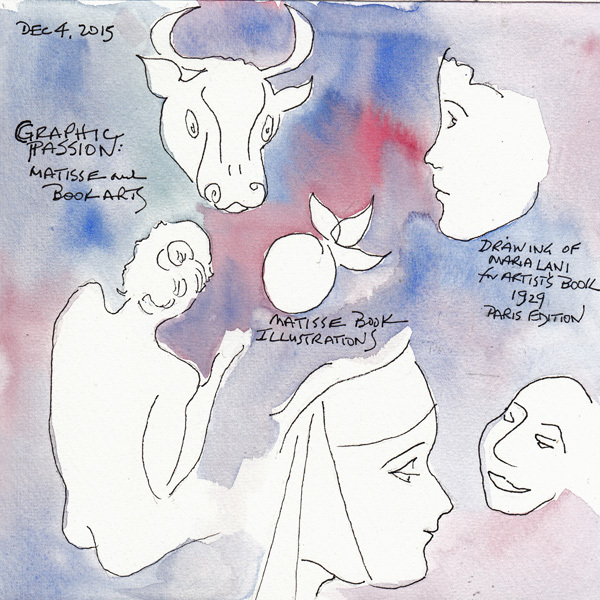 I walk through the exhibits with my sketchbook open and quickly draw images that I like. Here is one page of drawings from each museum. I could copy Matisse ink drawings and prints endlessly. They captured so much in so few lines. 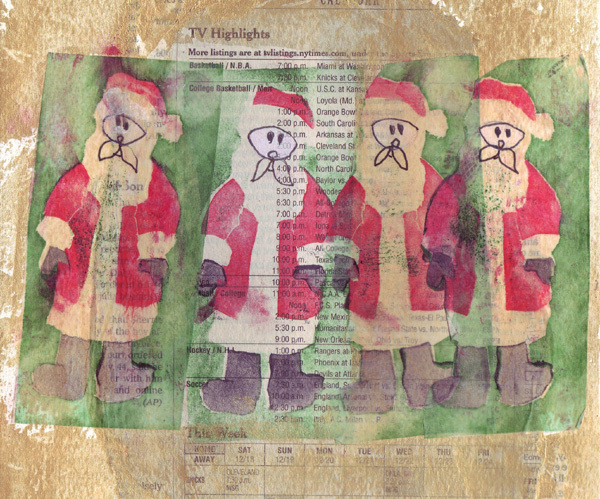 I was pulling out a set of fun foam stamps for the Santa image shown below, and thought my tutorial from December 2010 should be reposted this month. I have a few gift tags to make and this time will try to use F&W acrylic inks - based on my workshop this year with Judy Coates Perez. In our workshop we used some of Judy's fun foam stamps on fabric and paper. 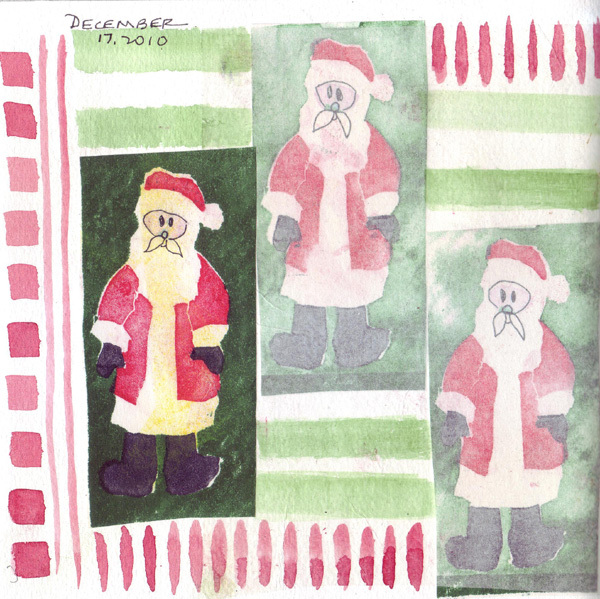 I used these stamps in 2010 for gift tags, and for the cover of small watercolor pamphlet-style books. Here are some of the practice images on various papers, including newspaper. I wrote a tutorial for making these very inexpensive stamps - really one stamp for each color. Here is a reposting of that blog post from December 2010. I will post some images made with the acrylic inks when I try them - although I used the ink on paper with a fun foam stamp in the workshop this November and it looked fine. 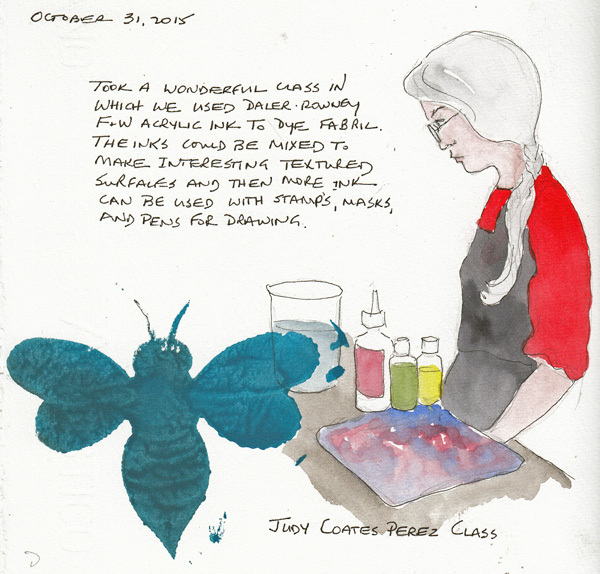 The blue bee was messily stamped on my sketchbook page at the workshop.